Eco-Lighthouse is a specific tool for taking environmental responsibility, and in 2011 Grieghallen had to fulfil 89 Eco-Lighthouse requirements in order to become certified. The requirements involved everything from waste management, good purchasing practices, transport and energy use to measuring the building’s energy efficiency. The Eco-Lighthouse certificate is valid for three years and the certified companies are followed up at the end of each period. Stricter requirements continue to be made, and fulfilling all the Eco-Lighthouse requirements is a large task, especially for such a special building as Grieghallen. The classification as an Eco-Lighthouse company is important to Grieghallen and gives positive signals to our customers. We notice that people who attend Grieghallen for events feel it is important that we are considerate of the environment. The front of Grieghallen is 3,500m² of glass and steel frames, and is currently undergoing the challenging task of re-insulation. Replacing the 45-year-old windows with better isolated glass is no small feat. This is a costly project which will take some years. Grieghallen is also working on smaller projects that nevertheless have a significant impact on the environment. Grieghallen has worked with a bee-keeper to purchase beehives for the roof, much to the delight of the surrounding flora. It all began with 60,000 bees in May 2018 and, after just over a month, there were 180,000 bees buzzing around on our roof. Bees are endangered, and getting their numbers up is beneficial for the surrounding area. The whole area around Grieghallen, with Nygårdsparken and Lille Lungegårdsvann, offers good habitats for the bees. The Eco-Lighthouse certificate means that Grieghallen works steadily on environmental measures. 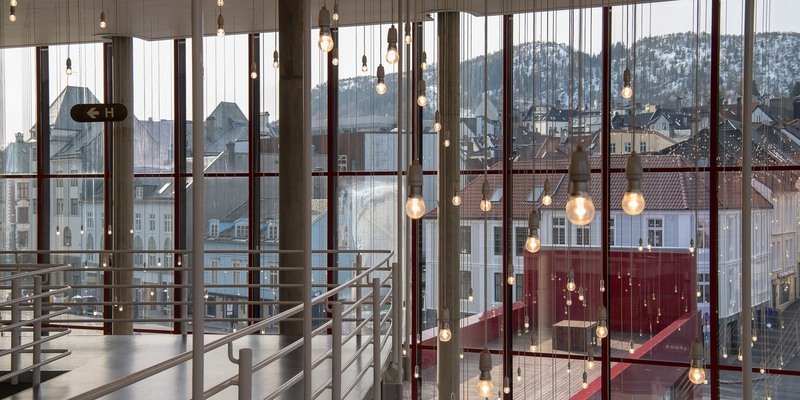 In addition to work with food waste and waste management, among others, costly investments have been made such as the replacement of more than 300 light bulbs in the Grieg Concert Hall ceiling with LED bulbs. Furthermore, 1,166 light bulbs in the foyer have been replaced with LED bulbs.